A little-known chapter in documentary history is that of Japan's pre-World War II proletarian film movement. 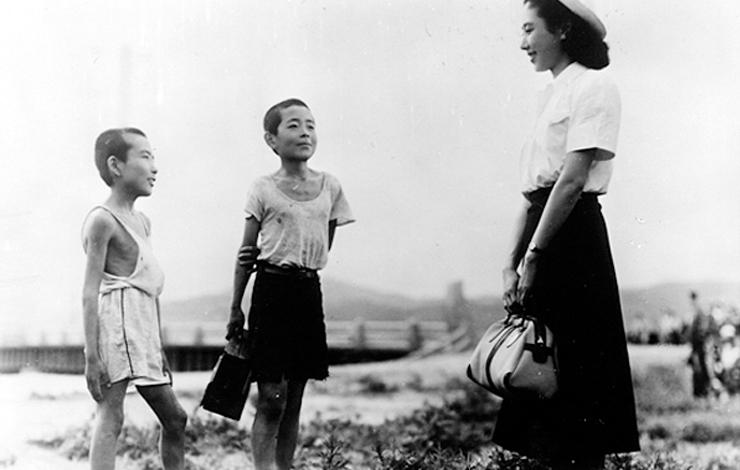 The organization at the core of this movement was the Proletarian Film League of Japan, known as Prokino for short. The founding meeting for the group was in 1929, and it was active for about five years after that. But these facts were little known after the war, let alone before it, and rarely appeared even in the histories written by scholars of Japanese film. In the 1960s there were some, par­ticularly young activists and filmmakers, who wanted to take up Prokino's work, and people like Fujita Motohiko and Makino Mamoru began studying Prokino in order to situate it in film history. In 1989 the Yamagata International Documentary Film Festival featured a section on Prokino. Recently Makino, a film historian, and A.A. Gerow, a coor­dinator at Yamagata, interviewed two of the original activists of the movement. Komori Shizuo served as secretary general of Prokino's Tokyo chapter and even­tually headed its central organizational division. He was imprisoned in 1934 for his leftist film activities and after his release worked in dramatic and documentary films and also wrote several thousand scripts for TV and radio, "not one [of which] I am proud." Nato Setsuo dropped out of the faculty of Nihon University to participate in Prokino in 1931. He later worked for Toho Motion Pictures and then joined the Kindai Motion Picture Association as a producer and company director; there he made such films as Children of Hiroshima and Live Today, Die Tomorrow. Part 1 of this article appeared in the March 1995 issue of ID. Read more: "Talking Heads: Prokino's Kmori Shizuo and Noto Setsuo Part 1"
NOTO SETSUO: My years in Prokino were from 1931 to 1932. When I look back over those two years, I can say that I did broaden myself. I walked all over Hokkaido, Okayama, and Kochi prefectures carrying a projector. I got tossed in the coop a couple of times. In Tokyo we had the Eye-Opening Troop (Mezamashitai), a mobile group that gathered together all the various cultural movements we've been talking about: the Drama and Artists Leagues, the Musicians League, and Prokino. We'd show films, sing songs, and make teams; we'd go to strikes and spur them on. The main task of the mobile group was Prokino. Screenings were quite a task, after all: you had to be careful. I'm from Sapporo, but when I went there to do screenings, I couldn't even visit my parents' house. If I turned up there, the neighbors would talk about how my family had produced a "red," and I'd cause everyone lots of trouble. KOMORI SHIZUO: The Bolshe­vization of proletarian cultural movements wasn't just writing novels, making movies, or paint­ing pictures. We also got the red people who liked film into groups, like fans of the film stars Hayashi Chojuro [later known as Hasegawa Kazuo] and Kurishima Sumiko. Then we'd work to educate them, to get them to lend their energies to the proletarian front. NOTO: We would keep people after a screening in the countryside and have a discussion . If during that discussion someone would speak up and, as we used to say, showed "good tendencies," close to the left, we'd mark them and pass it on to the locals. What we enjoyed, what made us proud, was our desire to make Japan better. l was 23 to 25 and I felt that things couldn't go on the way they were going. We had to do something no matter what kind of pains we had to endure. We were completely destroyed by police persecution. KOMORI: It got hard to pull people out. That's all I did, every day. And we didn't have any telephones in those days, you know. All of the activists began to have problems, and I just couldn't convince them to come out. MAKINO: Had production and screening activities already stopped by then? KOMORI: No. Screening activities continued until the very end. Prokino News and Rice Cakes for Worker-Farmer Solidarity were in production at the end. NOTO: The latter was a publicity film for the Common Life Union, calling for solidarity between workers and farmers through making rice cakes. KOMORI: It was nothing at all. It was just publicity for a rice cake-making machine. We only added the "worker farmer" part. NOTO: Just as Komori was struggling back in Tokyo, I was lent out from Proki­no to help make a tendency film. It was an allied independent production company, and for the first time I got to work on a 35mm dramatic film. It was called the Center for Research in the Art of Sound Film. They were comrades of Prokino, so Shino Shozo and I were sent out to work with their staff. We went off to make a 35mm dramatic film, and while we were gone, the head office was done in. We got off well as a result. MAKINO: So, Komori , you were arrested at the very end? KOMORI: Yes . After all, I was the secretary of the Tokyo chapter. All the central members of KOPF [the acronym for the Japanese Federation of Proletarian Culture Organizations, formed in 1931 as a leadership group for the proletarian culture movement] had been arrested at that time. We figured we were in trouble, that they'd be coming for us next, so we tried to keep working without going near the office. But a bunch of the special police busted into my house. They were strange, asking if I had a gun, things like that, and I figured I'd better not say anything out of the ordinary. It seems that they were a bunch of special cops from the Azabu station who had never arrested anyone before. MAKINO: With your arrest, Prokino was in effect finished. KOMORI: That's right. When I got to the police station, there were a number of people from the Ochiai dorm, and more people kept getting brought in. It was as if the next meeting of the Tokyo chapter was being held in the slammer. NOTO: Not just the movement, but all over, all leftist activities came under intense persecution. Of course, the cultural groups were first because cultural movements have the power to transmit. That had to be crushed . MAKINO: Looking back over it now, what did Prokino mean in each of your lives? KOMORI: For me, as an organizer for the movement, Prokino seemed, some­what against my expectations, to be distanced from film production. Later, it proved completely useless for my work as a scriptwriter. On the other hand, it did nurture in me an eye for viewing people and society. Then prison, along with military life and all those times in the hospital, I think helped give me a strange kind of courage. NOTO: Prokino was good for me. It was an independent production movement that got me into Toho where I continued to do film. After I quit Toho, I made and screened films independently for 40 years, the same thing I did at Prokino. MAKINO: At the Yamagata International Documentary Film Festival, they are getting submissions of full-length documentaries from young documentary filmmakers from all over the world. The circumstances are different, but in a certain respect, Prokino was similar in how it also collected its own money and labored to make films among friends. In what way do you think that a historical movement in Japan 60 years ago can be of help to young people today? KOMORI: Looking at things now, I think documentaries are more interesting than dramatic films. In the end, drama is just something made up, and while something made up can be interesting, it just doesn't develop at all. But documentary has developed tremendously. NOTO: Well , documentary was our starting point. Whether you are someone who has always done documentary from the start or someone who moved into the category of dramatic film through a variety of commercial activities, in the end, it's all the same. In The case of what I did in my life, I did independent production in both places. I was faced with bad conditions because I did leftist films. But of course, today's young people are also in a bad situation; because of some economic condition or the like, they also can't do what they want to do. But I think you must fight that which won't let you do what you want in order to do it. I want to appeal to everyone through the strength or magnificence of film. Even through hauling around a film projector. KOMORI: If we count up the total now, there were about 200 members of Prokino over the whole country. NOTO: When I think about it, film has a wonderful quality: you can study just by watching it. You can see America, or people in Hokkaido can see people working in Tokyo. There were photographs at the time, but if you wanted to see movement itself, there was only film. That attraction may be have been kind of childish, but at root, like Komori said, documentary was the origin of film. I'd go off with my projector and show them a film, and seeing a film was better proof than hearing a lecture. The audience would get excited and cause a commotion. You'd put on a record of "The International" or of a May Day song and then show the film with the record. We'd show them the May Day film, with everyone running around, and people would start buzzing, faces flushed, and get all riled up. At the end, in all the com­motion, if the cops arrested some com­rades, we'd be amazed at how people would shout about how they should go and get them back from the oppressive police. It's really amazing, and it's because film moves, I think. It may be petty and childish, but there was an amazing power to cinema itself. So if you wonder why we got involved in that move­ment then, with that number of people, and tried to take on the enemy full force, it was because of cinema's amazing communicative power. It's different from a play or music. You'd show it to them, and they'd understand right away. In that respect, I think the films we made in the movement were great. From today's perspective it looks insignificant, like we were just fumbling around, but we developed the film ourselves, we made animation—we did it all by ourselves. I don't think you'll find many other examples of that in film history. This article was originally published in Documentary Box (October 1994), the newsletter of the Yamagata International Documentary Film Festival. It was trans­lated by Alan Christy.